Welcome to my final post in the A-Z Of crochet series. I thought I’d finish off with a kind of cop out post, because Z isn’t a very popular letter! I’ve seen some beautiful chevron (zigzag!) blankets and thought I’d give it a go. This one is made using Ice Yarns and a 4.5mm hook. It is (or rather, will be) cot bed sized and I’m loving how the yarn is working up into these stripes. The tutorial I’m using is another Bella Coco one. 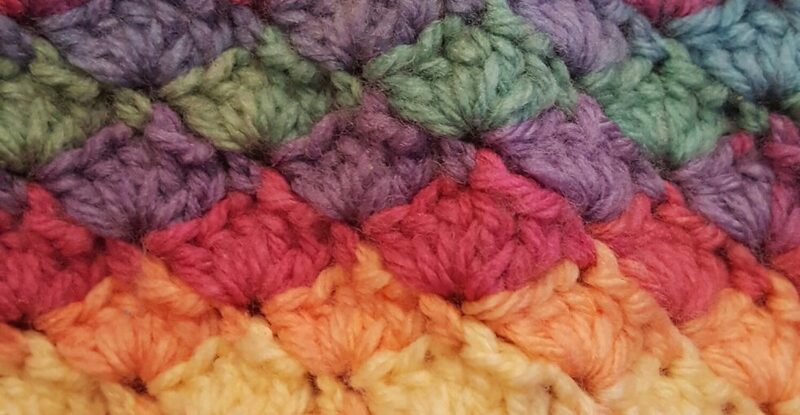 I am an impatient soul and when I saw it was made entirely in double crochet (US single) I very nearly searched for a new pattern as I wanted it finishing quickly. I’m glad I didn’t as although it’s not a tall stitch, it does work up very quickly. I’ve done all of this since last Tuesday, though I need to slow down as the rest of the yarn for the project is stuck at customs in Turkey. Well, that’s all folks, thanks for following my A-Z. I guess it’s time for me to go and think of more things to blog about now! Have you ever made anything using chevrons? What was it? And have you got any positive stories about yarn coming through customs without massive charges to stop me from worrying? Edited to add a photo of the yarn for Renee at So Craftastic. Ooh, am loving the zigzag/chevron stitch. It has aspirational edges! Thanks! They are aspirationally curling up, but there’s a pattern to fill them in. Awww this is so pretty. It makes me think of carnival rides. Carousel horses! I have no idea why… it must be the colours. Thank you, they are such lovely colours aren’t they. In real life they are slightly softer, like bright colours that have had a dusting of icing sugar to tone them down slightly. It’s certainly not going to fade into the background of mess when it does get to the kids room! My mind is already thinking of projects this yarn would kill! I cant wait!!! 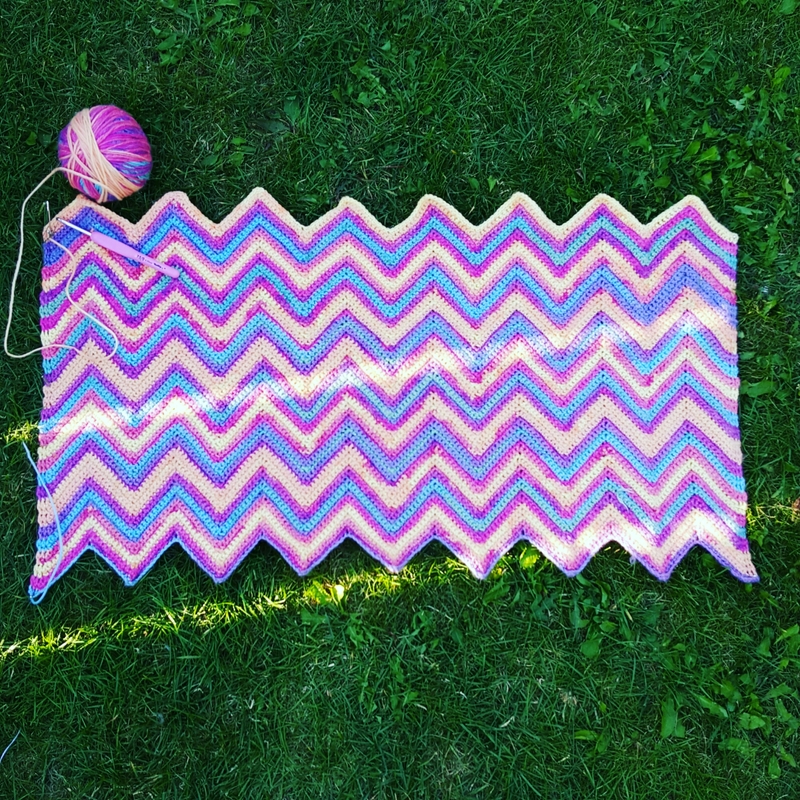 Love the zig zag afghan. That is the first thing I learned to crochet. I should try it again. Beautiful colors. Thank you, I’m kind of sad it’s over! Your new project looks wonderful! I do lots of knitted chevron things but one day I must try crocheted ripples. I’m hearing lots about that Ice yarn and how lovely it looks made up. So the customs hold up is the Turkey ‘end’?